Raytheon's KuRFS radar uses advanced electronically scanned array, or AESA, technology to provide precise, persistent surveillance of airborne objects. A small object takes flight, picks up speed, turns and heads south — directly toward a U.S. military base. It could be anything from a guided rocket to an explosive-strapped quadcopter. Back at the post, a Ku-band, or KuRFS radar detects and tracks the object so soldiers can make the call: It’s nothing to worry about. Just another bird. One of the radar’s many important jobs is to know the difference. 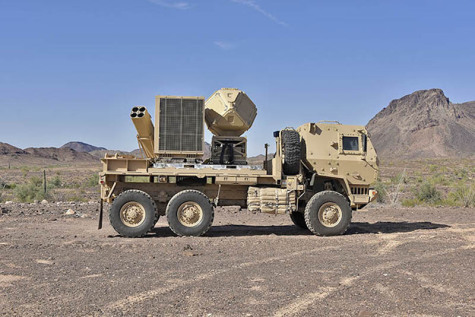 Designed and built by Raytheon, KuRFS is an advanced electronically scanned array, or AESA, radar that uses the ku-band frequency for precision tracking. One of its main missions is to provide nonstop surveillance of airborne objects, while another is to sense incoming threats such as rockets, artillery or mortars and warn soldiers so they can take cover. The radar is being deployed as part of a counter-unmanned aircraft system for the battlefield. When paired with Raytheon’s small, expendable Coyote UAS, normally an intelligence and surveillance drone, KuRFS becomes a hit-to-kill kinetic interceptor that can take out small, consumer-sized drones. The U.S. Army has taken the unique combination a step further, putting Coyote and KuRFS on an armored vehicle to create a mobile defense system. In addition, Raytheon has successfully integrated the radar into or tested it with a 50-caliber gun, the AI3 interceptor, land-based Phalanx weapon system and more. In August and September, KuRFS also cued targets during a test with Raytheon’s high-energy laser weapons systems. Perhaps the best trick up KuRFS’ sleeve is its ability to add more tools for future needs. In 2009, the Army put out an urgent request for a way to better warn about incoming rockets and mortars; just 19 months later, KuRFS went from Raytheon idea to deployed product. Raytheon met the timeline by scaling down the larger Ka-MRFS radar, using open-architecture software, tapping its vast pre-existing line of radars for proven parts like processors, and adding new technology taken from its internal research and development efforts. The result was KuRFS. Today’s version includes several upgrades over the original, and the radar system itself is nearing its millionth hour of operational time. As such, it’s become a prime example of how the Army’s vision for faster development of adaptable technology is already taking place.